"Aurora" is Dawn in Latin, that's where this idea came from. The Gold color (courts) representing sunrise... and Silver (numbers) representing sunset (nightfall). The center of the back of the card is the Sun. Feast your eyes on the Aurora deck created with a gold foil embossed tuck case and each card printed with metallic inks. The Aurora is a great display piece for any card collection. Art work by Johnny Whaam and printed by USPCC. All court card are fitted in gold, while the numbered cards are fitted in silver. This combination gives this deck a unique appeal that no other deck has ever done. 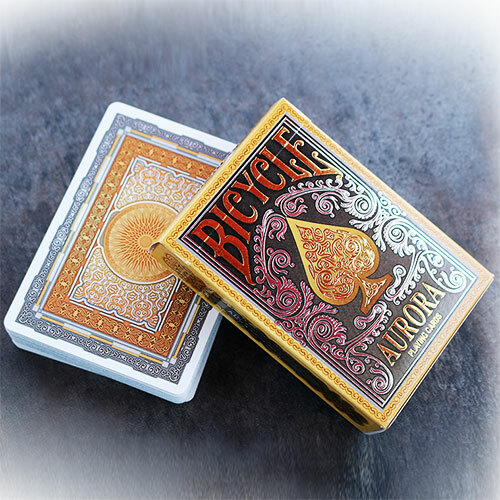 Printed by USPCC, Embossed Tuck Case with Gold Foils, Metallic inks on card faces, Custom Stamp Seal, Air-Cushion Finish, 100% hand drawn artwork and custom pips • The cards are poker size and of the usual Bicycle quality. Αυτό το προϊόν προστέθηκε στον κατάλογό μας την Wednesday 21 September, 2016.